September 25, 2006. Seventy-fi ve thousand people packed into the Superdome to watch the fi rst football game in New Orleans in nearly 21 months. With the city cramming fi ve thousand more people than capacity into the Dome, you could hear your ears pop from the pressure. The crowd was just waiting to explode when on the opening drive, Michael Vick fumbled the ball, letting it bounce out of bounds before the Saints could recover. You could hear the crowd exhale, their breath sounding like a ticking time-bomb. The next play, Gleason ran up the middle, blocked the punt, and dropped to his knees as it was recovered for a Saints touchdown. He then got back up, running with his hands outstretched, a big smile, his hair whipping underneath his helmet, as he took it all in. Being a hero in New Orleans doesn’t grant you worldwide recognition. What's made Steve Gleason a hero to the rest of the world is how he has championed the diagnosis of amyotrophic lateral sclerosis (ALS), sometimes referred to as Lou Gehrig’s disease. Steve was diagnosed in January 2011 and launched his foundation, Team Gleason, later that year. Team Gleason has drawn national attention, with Steve and wife Michel Varisco appearing on “Good Morning America” on July 1st of this year. According to Clare Durrett, a member of the board of directors of Team Gleason, the foundation was created because Steve wanted to “inspire others to seek adventure in their lives and also help provide others with ALS with assistive technology that is essential for continued living, communication, and being productive.” Durrett states: “Our ultimate goal would be that Team Gleason would not be necessary, which would mean ALS now has a viable treatment or ultimately a cure." Team Gleason recently had a two-day summit in New Orleans, where the goal was to help achieve some progress for all the parties included. Steve gave everyone a goal to “think like a beginner,” the idea being to leave no stone turned over merely once. Over 45 scientists and doctors partook, along with over 80 ALS patients, but the summit reached more attendees than that. It was streamed online, allowing people to listen in as well as ask questions. The summit was seen in nine different countries, and was viewed by more than 1,500 people. For people who haven’t lived in New Orleans, or didn’t watch the Saints through the 2000s, it may be hard to believe the person who they see now was a former NFL player. Much like how many people may think of Lou Gehrig not as a star baseball player, but as the man slouched near the microphone, limping and covering his mouth, some people may think of Steve as he looked on “Good Morning America”— in a wheelchair, with short hair, sporting an “Awesome Ain’t Easy” T-shirt. Steve played for the New Orleans Saints for eight years as a special teams player. The iconic play of his career will always be the blocked punt against the Atlanta Falcons in the fi rst game back in the Superdome. In his collection of stories 1 Dead in Attic: After Katrina, Chris Rose captures the moment, explaining “…there’s something about waking up in a community that’s thinking the same thing, that’s feeling if only for a moment, as if we had all just accomplished something together…but let us live it, just for today, because who around here hasn’t felt as though we’ve had a big ‘L’ stamped on our forehead for the past year.” Rose fi nishes the piece: “Only a game, you say? Like hell it was.” Just like that, an icon had been born. 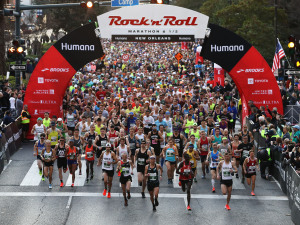 Just like that, a city had something to celebrate during its rebirth. Steve corresponded briefl y with Where Y’at following the recent New Orleans summit. 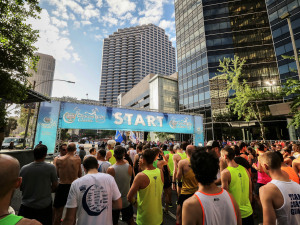 Where Y’at: When you met with Josh Elliot of “Good Morning America” earlier this year, you said how you “dreaded the loss of running”. Upon the arrival of that loss, you mentioned how you had to look for “new avenues of joy” and that “with each loss, we have worked to find a beautiful replacement.” Can you tell us about some of those beautiful replacements? Steve Gleason: Sure. We have tried to be creative on the journey. I still write every day. I am helping create music. We are continuously shooting and editing fi lm for our family library and a forthcoming documentary. Our work with the foundation continues, particularly the adventure production and technology development. These are my news ways to “run”. WYAT: Do you have any words you’d like to share with people who are suffering from similar challenges, and are facing the fear of losing their own version of “running”? SG: I think people can lose their sense of purpose. As a result, a creative and persistent effort must be made to seek activities to renew the purpose in someone’s life. This is applicable to all people, not just ALS patients. It isn’t hard to understand why Gleason “dreaded the loss of running”. You don’t need to be a basketball player to appreciate the magic of Michael Jordan, to be in complete awe as he changed his mind in mid-air on how he was going to score. You don’t need to be a football fan to appreciate that someone who looks more like you and me than Ray Lewis can be good enough to be in the NFL. So perhaps you can understand how losing that could be so painfully diffi cult—when something you’re so good at, your meditation, is ripped away from you, with no way of recovering it. So the fact that Gleason is able to continue to fi nd new and creative ways to “run” is a thing of beauty. The fact that he takes such great pride in making a family library, which consists of him and Michel making videos on a variety of subjects for their son Rivers, is a thing of such great love. 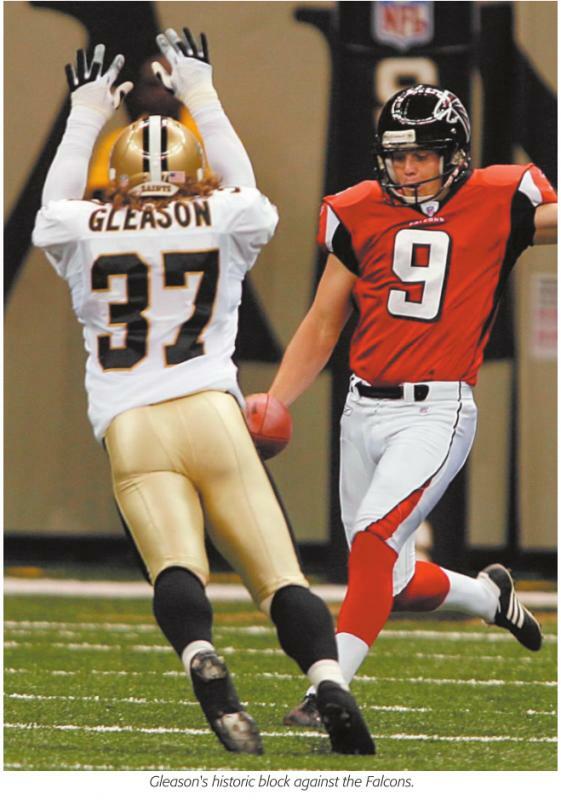 The day the statue of his blocked punt was unveiled, Gleason said, “When other people see a situation as wasted, or worthless, the people of a community can take that tragedy and put it into something heroic.” That day, Gleason’s block was something heroic for the city to celebrate. Years later, Gleason fi nds himself turning a personal tragedy into something heroic, every day. Gleason created a foundation that helps so many people. He is the change, the effort, the love in life we all want to see. On the one-year anniversary of his diagnosis, he went skydiving. He recently, with the help of former New Orleans Saints linebacker Scott Fujita and a crew of family and loved ones, hiked Machu Picchu. Steve understands what these actions can mean, what these messages mean, that love transcends our bodies. This is epitomized in the video recordings he does with Michel for their son Rivers. That’s why I will continue to tell stories about Steve Gleason. That’s why there is a statue encapsulating his greatest moment on the fi eld, adjacent to the Dome. That’s why the statue is titled “Rebirth". He was a hero of this city’s rebirth, before he had to be the hero of his own. Because the world is better with people like him around. His stories transcend any restrictions his body might have, now or later. And I can’t say it any better than Steve, so I’ll let him have the last word. WYAT: From hiking Machu Picchu, to skydiving, to being a professional football player and a philanthropist, you have accomplished feats in your life that some people may not find possible to do in their lifetime. Can you explain where you get the strength to overcome the challenges before you can champion those moments in your life? SG: I am committed to continue the activities I love, with the people I love. Simple, right?